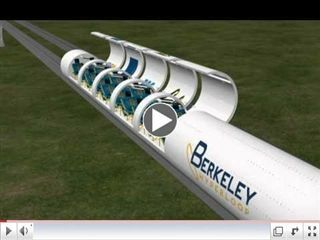 Tyler Chen '15 is helping design the future of transportation as a member of the Berkeley University SpaceX Hyperloop Pod Competition team. The competition, inspired by a white paper published by visionary entrepreneur Elon Musk, calls for teams to design and develop a prototype pod for Hyperloop: a solar-powered, transonic transportation system that consists of passenger/cargo "pods" traveling at upwards of 750 m.p.h. through a low-pressure tube. The Berkeley team is one of just 150 teams to pass through a preliminary proposal stage. This week, Tyler and the team will present a final design to SpaceX with hopes of becoming one of twelve teams that will move on to the final phase of competition - building a pod at 80 percent scale, and testing it on SpaceX's mile long test track in Hawthorn, California. Click here to view a simulation of the team's design.